The BigBore II-H series Subsea Wellhead Systems are Dril-Quip’s next generation wellhead system designed for deepwater, deep well applications. The BigBore II-H System features higher load carrying capacity and higher temperature ratings. It has been designed to facilitate the drilling of wells that penetrate shallow water flow zones and require several casing strings to accommodate small pore pressure/fracture-gradient differentials. The BigBore II-H Subsea Wellhead System allows an additional 18" casing string, hanger and seal assembly to pass through the 18-3/4" wellhead with the BOP stack and riser in place. This accommodates drilling and running a large bore diameter casing string through shallow pressurized water sands with complete BOP control and with drilling returns back to the drilling vessel. 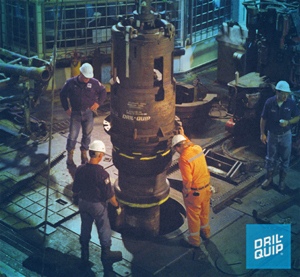 Contact your Dril-Quip representative for more information about the SS-20 and SS-15 BigBore II-H Subsea Wellhead Systems.